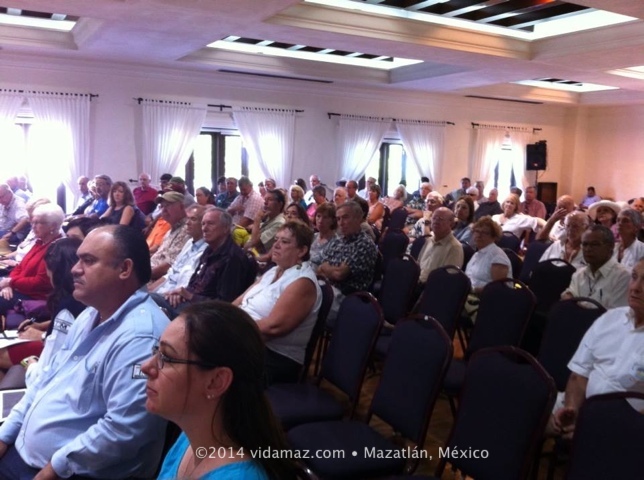 Town Hall Meeting for US Americans in MZT | ¡VidaMaz! Yesterday, Friday January 24th, was our annual USA citizens’ town hall meeting at the Hotel Playa at 11 am. Several people have asked us for a report. Please allow us to summarize here on the site what we heard yesterday. Feel free to add in what we’ve missed, or to correct something you may have heard differently! John, our wonderful consular officer, was here from Hermosillo, accompanied by Rob, the security officer, and Ian, also from their office, who’s been filling in a bit for Luís Ramirez while he’s out of town. Heather and Lety, our local consular office staff members, received a big round of applause, as did Luís in absentia. Adriana from our local office of Migración gave a short presentation, interpreted by Isa Medina. No one from Aduana/Customs attended. Iván Pico from the Mayor’s office was present, but was not asked to speak. The meeting last about 90 minutes, and was well attended, though there were fewer people than in prior years (maybe 150 people?). John gave an overall report and then asked for questions, as did Ian and Rob. Last up was Adriana. John asked for a show of hands for how many present had lived in Mazatlán less than five years, more than five, more than ten, etc. Most present have lived here over five years. The person present who has resided here the longest was Khacho, of JungleJuice fame, who said she’s lived in Mazatlán for 39 years. Only two or three hands were raised by people who had lived here fewer than five years. Interesting. Not sure if newer immigrants just didn’t attend the meeting or hadn’t heard about it. Rob and John both congratulated our governor for all the hard work he’s done to stem violence in our state as well as to change perceptions of violence here. Everyone agreed all is much calmer than it was for a while. In response to a request that the officials present do all in their power to stem the tide of sensationalistic State Department reports, Rob explained about the “double standard” law on the books in the US. It states that if any officer of the US government cautions any employee about safety protocol, that same message must be shared with all US citizens. Rob said that while the intent of the law is good, that’s why we get so many warnings that may seem silly or overly cautionary. Interesting to know; puts things in context a bit. Adriana from Mexican Immigration read the definitions and prices for the top three visa categories, with Isa interpreting. There were two main lines of questions for Adriana. The first was about how to renew visas. Such information is publicly available, and Adriana patiently attempted to answer audience members’ questions. It was obvious that too many rumors are going around about changes in visa status, that those in the room who have renewed visas are comfortable with the new process, and that accurate information on this topic is available online as well as in the Immigration office, so expatriates are encouraged to go to the source rather than believing or passing on hearsay. Towards the end of that discussion, 15 minutes were spent on personal inquiries, which John ably redirected to private discussions upon conclusion of the larger group meeting. Quite a bit of discussion was had around the need for residents to check in and out when they leave the country. While the process at the airport is streamlined, land crossing is met with much confusion on the part of the foreign community. It was clarified that if leaving on Highway 15, one should check out and in at the 21KM checkpoint, even if they have no automobile-related business to tend to. It was pointed out that an official request to the Mexican government has been made to install signage for northbound travelers, and to improve traffic safety at this point. Adriana pointed out that there will be circumstances where checking in or out is not possible, with the example being any foreigner who travels overnight on a bus. The response to this was the familiar, ni modo. An inquiry was made about U.S. Notary services while Luís is out of town. It was pointed out by John that the Hermosillo office was sending officers down as needed to deal with this and other necessary work. If U.S. Notary service is necessary, one should check with Heather or Lety to see when such service will be available. A brief discussion around mordidas, or bribes to police officers, included a show of hands of who has been “shaken down” and who has not. Fortunately, very few have ever encountered issues. Those that do are asked to do their best to get the patrol car number, note the day and time, and report all to Iván Pico at the Mayor’s office. Not so much to report. It was good to see everyone. I believe you all join me in gratitude that John and his staff hold these annual Town Hall meetings for us. Also many thanks to Lance at the Hotel Playa for donating use of a large salón for this purpose. On a personal note, let’s all remember that we are guests in Mexico. Mexico is a sovereign nation free to change laws that affect us without consulting us or the U.S. Government. While we can ask our government representatives to explain what they believe is going on and ask them to inform their Mexican counterparts of our concerns, Mexico is under no obligation to heed such input. Mexicans are the first to admit that some of their laws and procedures are outdated, inefficient and nonsensical. Such is true in most countries. But we are obligated to follow those laws and we have no right or expectation that our government can change things. Expecting otherwise will most likely only get one frustrated. Sometimes, we actually write blog posts together! ← Ready for Carnaval de Mazatlán 2014? So was this not the proper venue for bringing up the disproportionate increases in predial billing? No one asked about property tax bills while we were there, Tony. We did leave perhaps 5-10 minutes before the meeting officially ended. thanks for the summary Dianne! We were out of town so we appreciate your straightforward reporting of the issues covered. gracias mi amiga…. Por nada, Barbara. Glad you found it helpful. Hope you were somewhere fun! Very interesting, even to this Canadian! Thanks Dianne!